・Functions The parts surrounded by red circles and the background are buttons. 1. Open sound selecting list. 2. Stop or Play movie. 3. Change movie rotation order. Normal, Reverse, or Random can be selected. 4. Repeat or Non-repeat sound. 5. Start or Stop sound. 6. Hide or Show sound information, which appears during sound is played. ・ Background Open Japanese help page. Masjed-e Jame (Friday Mosque) in Esfahan, Iran. Conspicuous damages are recovered with graphics editing software. 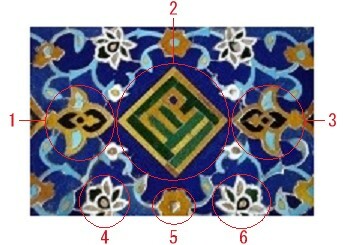 The symbols on the center are designed Arabic letters. Each meaning is as below. The played-back sounds are Adhan, the Islamic call of prayer. it is not a part of the Qur’an. but their words are almost the same. The sound sources are on a download page, http://www.audioquraan.com/adhan.asp. Most of the sounds are direct-linked to AudioQuraan.com. But those that are not in mp3 format, or have conspicuous noise, are converted. because of limited space, or to be read more easily. The titles begin with Al- are the name of the mosques, and added city names. The titles not begin with Al- are seem to be the names of the chanting persons. which is named as “Masjid Al-Aqsa – 1” in AudioQuraan.com. and it notates the same sound as “Adhán z mešity Al-Azhar v Káhiře - Egypt”. because this is convenient to distinguish from “Masjid Al-Aqsa – 2”. All of them are wonderful, although a few have some cough or noise. The most recommended one is “Al-Azhar Cairo (Masjid Al-Aqsa – 1)”. Selecting Random and Repeat would be also fine. 沈黙の音を聴け (“Listen to the Sound of Silence”, Japanese) It also mentions of Adhan. "System" -> "Administration" -> "Add/Remove Software"
"Applications" -> "System Tools" -> "Terminal"
"VMware Player" -> "Shared Folders" -> "Always enabled"
"System" -> "Preferences" -> "Personal" -> "Sessions" -> "Add"
It was tough work more than I had thought, so I explain the method. so there ware few problems to install VMware Player and Fedora 10. The tough work was installing VMware Tools. There ware three functions, which I needed. Methods that I tried to install VMware Tools are three as below. but none of the functions above can be used. but not written tested on Fedora 10.
probably using open-vm-tools is the easiest way. for too many dependent modules and complicated settings are required. Installing from linux.iso included in VMware Player 2.0, you mustn’t do this. and the version of VMwareTools of Mware Player 2.0.5 is 6.0.5. So at a glance version 6.0.5 is better than 2.0.0, but never use this to Fedora 10. When compiling errors occur, and if you still continue, Fedora 10 will freeze. Even Ctrl+Alt+Insert (forcing reboot) doesn’t work! You will have to restart from installing Fedora 10.
installing from linux.iso included in VMware Server 2 for Windows. Download VMware Server from the VMware site and install. Which needed is only linux.iso, but without installing, it cannot be extracted. When installing VMware Server, it is impossible to coexist with VMware Player. better to save your work and time. Don't forget to copy linux.iso, before installing VMware Player. Because when VMware Player is installed, the files of VMware Server are removed. Details are omitted. Refer to other sites. because the media of Fedora 10 is a Live CD. though they can be added with yum command. There are four needed packages as below. No need to install one by one. You can just check the packages and install later all of them at a time. There are two reasons as below. Describe in "vmx" file as below. "linux.iso" is the extracted file at step 1. The described way above is the case linux.iso is in the same folder with "vmx" file. If linux.iso is not in the same folder with "vmx" file, describe the path. "D:\share" is the name of the folder on the Host OS. Describe the path of the folder, which you want to share. "share" is the name of the shared directory on the Guest OS. /mnt/hgfs/share is the shared directory in this case. The name of share can be named what you want, but /mnt/hgfs cannot be changed. It is possible to mount any mount point you want by editing /etc/fstab or mount command. If you want to put the shared directory on another place, set a symbolic link. Using GUI is easy, though cp command can be also used. There is an icon named VMware Tools on the desktop. Click this icon and you can see a file named VMwareTools-2.0.0-122956.tar.gz. Drag and copy it to any working directory, which you want. There is a file named VMwareTools-2.0.0-122956.i386.rpm too. But in this case, using rpm doesn’t save your work nor time. So using VMwareTools-2.0.0-122956.tar.gz is better. Click the file and you can extract it easily, though tar command can be also used. Hit Enter to all the questions is all right. there is no xorg.conf, can’t create xorg.conf. Because Fedora 10 doesn’t need xorg.conf by default, so you may ignore these messages. Caution of xorg.conf is described in appendix. Is seems no problem without doing it, but do it for the present. ・Share folder of Host OS with Guest OS (HGFS) can be used now. In case the folder cannot be shared, check from the VMware Player menu as below. those two functions are still not effective. The command that execute these functions is vmware-user command. so these functions cannot be used even after reboot. To execute vmware-user when login, set as below with GUI. Name and Comment will be any words. Now reboot and login, then all the needed functions are effective. but it seems to be still necessary in cases using a touch pad etc. If /etc/X11/xorg.conf exists, Fedora 10 uses its setting. But a caution is needed here! and cannot be used without modification. You should not copy it to / etc/X11/xorg.conf directly without modification. and might have to restart from installing Fedora10. and to set a symbolic link it to /etc/X11/xorg.conf. untill you can get the bset setting. /etc/X11/xorg.conf can be set as a normal file instead of a symbolic link. In case the screen of Fedora 10 cannot be seen, reboot with Ctrl+Alt+Insert. Even in the worst case, you can change the name of xorg.conf on the Host OS and login. Unnecessary sections in the template are probably as below. It would be better to remove or comment out these sections and try. The latest version of VMware Player is 2.5.1 at this moment, but 2.5.0 is more useful. I had to click three times to change on version 2.5.1. Probably it would be a small bug. copyright © 智恵の海 all rights reserved.